« Camping at the margin! The Arctic, I learned last week, is teeming with wildlife, much of it barely visible (if that) to the human eye or covertly thriving in dense vegetation. We spent two separate modules on organismal biology, the first in aquatic ecology under the tutelage of expert IGERT fellow Jess and the second in population ecology and herbivory with Matt Ayres. 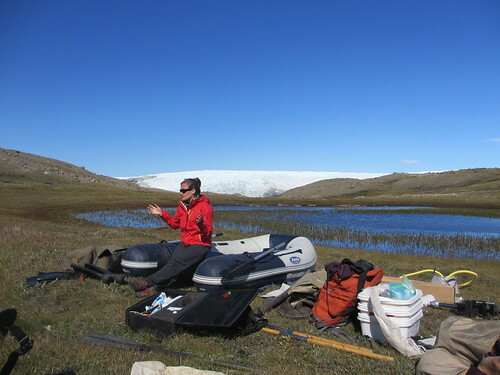 Jess’ classroom was a lake adjacent to the ice sheet margin, and her zeal about both the location and the organisms we found engendered excitement among the biologists and non-biologists alike. She talked to us about the aquatic food web and thermal lake stratification, describing that lakes typically have three layers: the epilimnion (surface layer), metalimnion (middle layer, AKA thermocline), and hypolimnion (bottom layer) that vary by density. She then had us see what we could catch in nets along the lake edge. 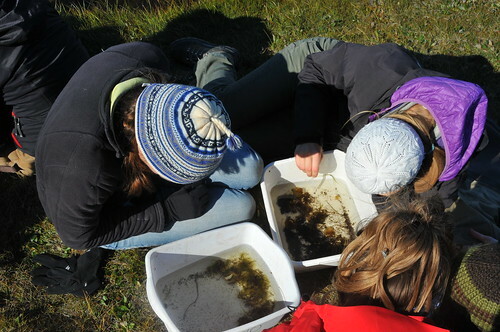 We put on comically large waders; scooped up water, slime, and small plants; and dumped our findings into plastic buckets to see what was moving. One of the most ubiquitous organisms we found was the diving beetle, Colymbetes dolabratus, the mosquito’s greatest enemy (I liked this thing instantly when I heard that). We found it both in adult form and in larva stage, which I was surprised to learn was even larger. Other notable findings were Chironomids, midges whose eyes and internal features we could see with a hand lens or macroscope once pipetted onto slides. Some of them were even red because their blood was oxygenated. We could see their guts filled with food, which they frequently passed. Their circus-like, rapid flipping movement impressed those of us who had never seen such a thing before! Apparently, these creatures, which looked a lot like worms to me, will turn into flies someday. Other organisms we collected included ubiquitous mites, zooplankton-like Daphnia, fairy shrimp, and cyanobacteria (one of which closely resembled Gloeotrichia, a species Jess and lab her labmates study back in the Upper Valley!). Watch for upcoming posts on the shrimp and cyanobacteria from Chelsea and Jess, respectively. 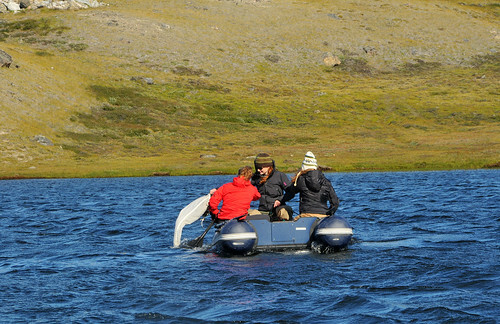 Our specimen collection didn’t end with the near-shore ecology; an inflatable boat took us out into the center of the lake to collect profiles of temperature, conductivity, pH, and dissolved oxygen. 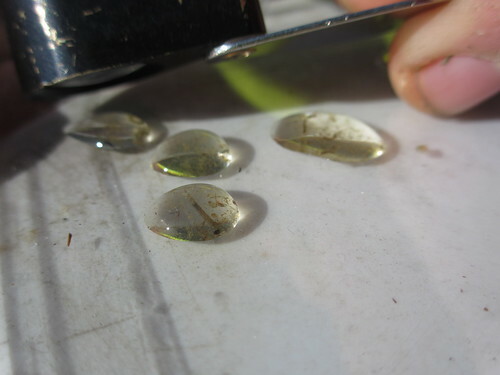 Unfortunately, the high winds precluded us from keeping the boat in a single spot, and they led to so much mixing that the multiprobe readings reflected zero stratification. Nevertheless, the boat trip was instructive for the non-aquatic ecologists in terms of providing a sense of typical measurements. A net we dragged behind the boat did yield some interesting finds; Jess bottled up the zooplankton from the lake center to take back to Hanover and examine in more detail. Water isn’t the only home of Arctic animals, and we spent part of the next day searching for organisms that live on land. We had already established that our environment supported only 5 mammals—musk ox, caribou, Arctic fox, Arctic hare, and humans—most of which are vegetarians. But it turns out that they’re not the only herbivores in the tundra! Matt brought us out into a vegetated field and showed us to how to find the smaller herbivores, which make up in cumulative biomass what they lack in individual size. We were looking specifically for caterpillars, which had a huge population boom last year. We heard stories from IGERT cohort II about how these creatures were all over their tents and how it was difficult to walk without stepping on them! We hadn’t seen any caterpillars yet, but the abundance of overgrazed (i.e. dead) Betula nana was evidence that cohort II hadn’t been exaggerating. We marched through the vegetation, swinging wildly at the leaves with our nets. We then examined our collection…and here began the fun part. 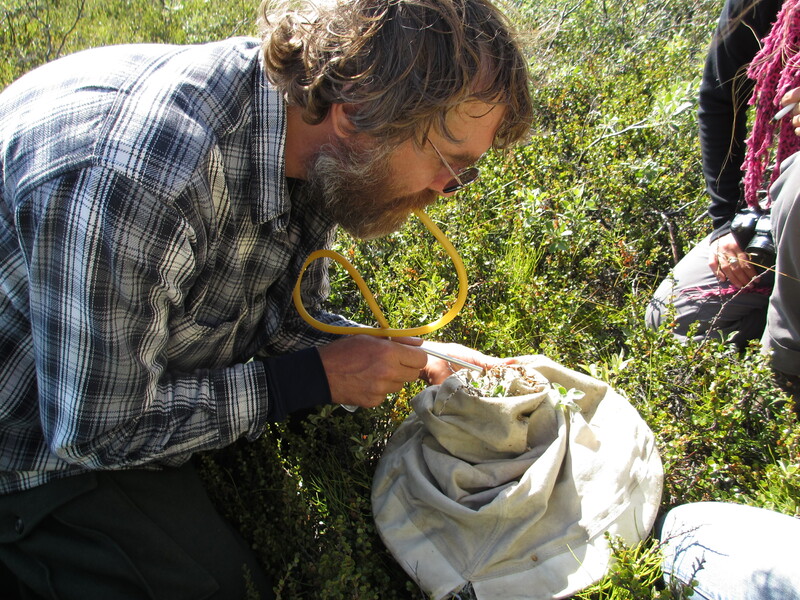 Before the bugs scampered or flew away, we had to catch them by sucking them into a sample bottle (a process called “aspiration”). Because there’s a screen between the mouth tube and the sample bottle, it is impossible to have a critter end up in your mouth, but it still took some of us a little while to get used to. We found surprisingly few caterpillars; Jess and I found a rough total of five in eight net sweeps. 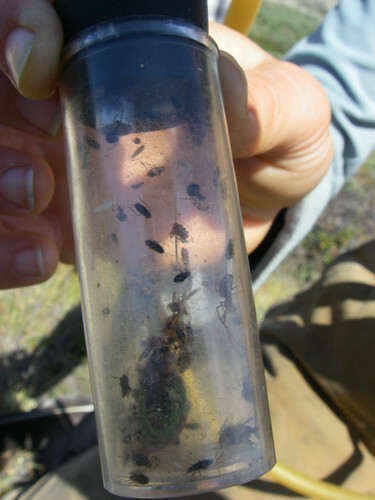 Instead of caterpillars, spiders appeared to comprise the majority of small creatures in the tundra vegetation. But this begged a question: since spiders are not eating the plants, what are they eating? We came up with a few hypotheses, the most promising of which seemed to be that they were eating each other (I didn’t know spiders could be cannibals). Isotope analysis back in Hanover would tell us for sure; because organisms preferentially excrete the lighter form of nitrogen (N-14), heavier nitrogen (N-15) builds up in tissues. This means that the primary producers (plant-eaters) have relatively low levels of heavy nitrogen while animals farther up the food chain have increasing concentrations of it. We’d expect all organisms at the same “trophic level” to have about the same concentrations, but if the spiders are eating each other, there will be greater variation than normally expected (since they’re eating each other as well as below their trophic level). Little did I know that isotopes could tell us about spider diets as well as past climates and glacial extents! After the insect and spider lesson, we ventured over to the ice sheet to explore two different parts of its margin. But I returned to the ice with a much greater appreciation of the myriad of dynamic systems at work on the world’s largest island. Great post, Ali. I’m happy that you all got to see Colymbetes dolabratus and all of the other beautiful aquatic critters.